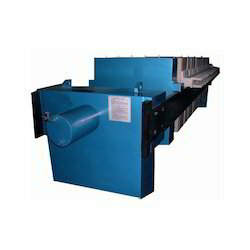 We are a preeminent supplier and exporter of a broad spectrum of superior quality Industrial Hydraulic Filter Press. The range made available by us comprises of best quality in international standard with perfect design and high durability that are sourced from the most authentic vendors of the market. Offered at affordable prices, our product-line is applauded for its perfect sizes, finishing and eminent durability. Leveraging our rich industrial expertise, we make available Industrial Hydraulic Filter Press to our venerable customers. Extensively utilized in industrial filtration applications, this machine is widely demanded in the market. Our experts have designed this machine using premium quality materials and sophisticated technology. Customers can avail these machines at standard market prices. Looking for Industrial Hydraulic Filter Press ?